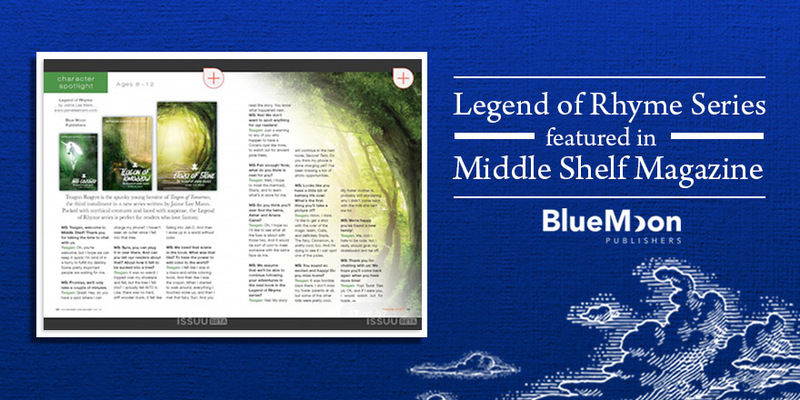 Legend of Rhyme Series Featured in Middle Shelf Magazine! Jaime Lee Mann introduces the new Legend of Rhyme series character, Teagan Rogers! Blue Moon Publishers and Jaime Lee Mann are very excited about a feature for the Legend of Rhyme series in the popular and highly regarded Middle Shelf magazine! The publication features quality middle-grade fiction, and was interested in a Character Spotlight for their November/December issue. It is difficult to answer this question without spoiling the story for anyone who has yet to read it, but I will try my best! I needed a character with a bad home life so that she would be okay with leaving it behind forever. She also had to be very spunky, and so I modeled her after my youngest daughter, Shelby. Even though it was tough when she was four (and still is some days) I admire my daughter very much because of how she never fails to assert herself, and so I wrote Teagan with the same qualities. It is important to me that children read about strong female characters who don’t need to be saved by anyone, and Teagan is one of these fierce ladies in the Legend of Rhyme series. Each issue of Middle Shelf features a character interview from a book series and for this feature, Teagan Rogers, one of the characters in the latest instalment, Teagan of Tomorrow, was interviewed. For an interesting insight into Teagan, read the feature for yourself! Middle Shelf Magazine offers “Cool Reads for Kids” and features author interviews, reviews, excerpts, and more. You can sign up for a free subscription right on their website. Do you subscribe to Middle Shelf Magazine?